Keep an eye out for donation bags in your neighborhood each April. Many personal care and hygiene items are expensive and ineligible for purchase in the Supplemental Nutrition Assistance Program. Thus, low income families often have difficulty maintaining an adequate supply of these products. WRHM provides clients with access to personal care items, including personal care products like hair care items, soap, deodorant, shaving needs, and feminine hygiene products. We are especially thankful for the Girl Scouts of Eastern Missouri’s April Showers program, which supports our personal care and hygiene programs. Keep an eye for donation bags in your neighborhood each April. 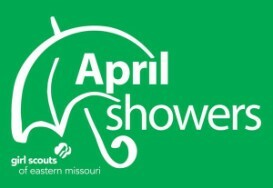 Click on the April Showers logo to visit the Girl Scouts of Eastern Missouri’s website.